Did Doug Ford consult any students for his “For the Students” plan? Yes — but just the alt-right ones. 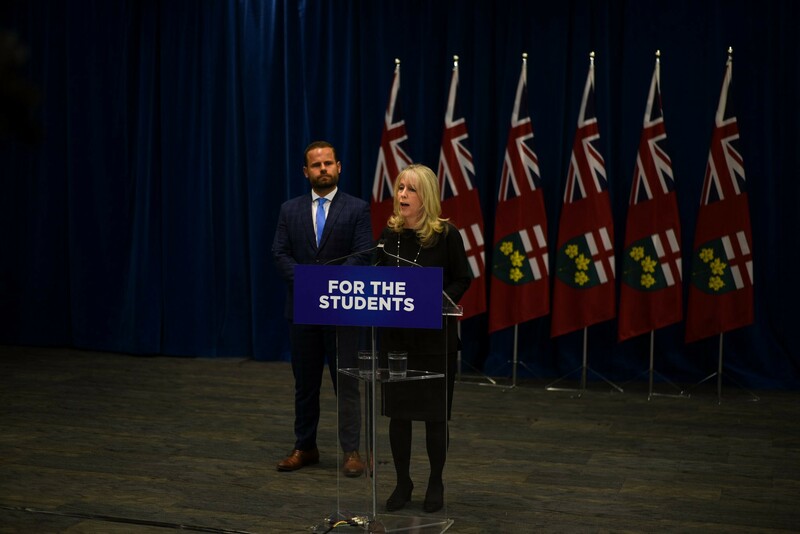 On January 17th, 2019, Doug Ford’s government announced a new funding framework for Ontario’s post-secondary education system that, in addition to throwing students further into debt, includes a policy called the “Student Choice Initiative” which will allow students to opt-out of ancillary fees. The opposition from stakeholders has been universal, including virtually all elected student union leaders and campus clubs, student newspapers, the Canadian Federation of Students, the Ontario Undergraduate Student Alliance, the College Student Alliance, the Ontario Confederation of University Faculty Associations, the Ontario Federation of Labour, the Canadian University Press, and many more. With the entire college and university sector united against Ford’s initiative, the question is: did they even consult any students on this “For the Students” plan? When asked directly about this following her press conference, and then later on CBC’s Power and Politics, Minister Merrilee Fullerton was unable to name a single student or student organization that she had consulted. But there was one individual on Twitter who insisted that he had been consulted, and even claims that his student organization had come up with the idea. This was Michele Di Franco, Vice President Finance of the University of Ottawa’s Students for Free Speech. In August 2018, his organization had participated in a provincial Free Speech Roundtable alongside other Free Speech groups from the University of Toronto and York University. Premier Ford and Minister Fullerton were both in attendance. 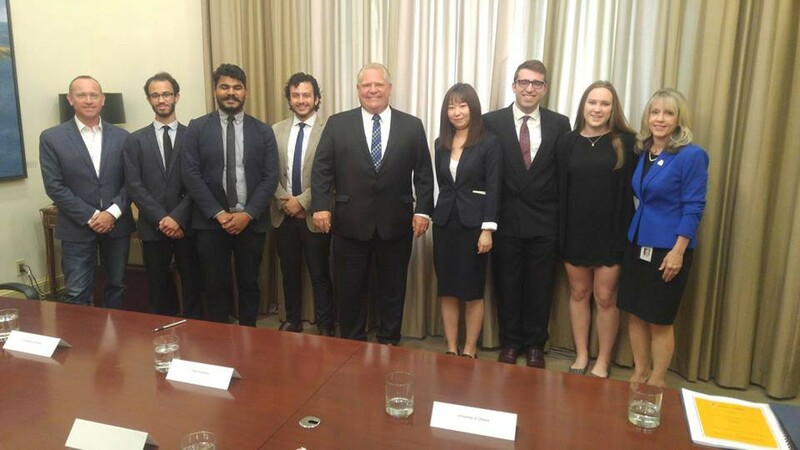 Video from that meeting was posted online by the Ford government the very next day when they announced their new plan to force universities to implement government-mandated free speech policies. It is essential to point out here that the Roundtable cannot truly be called “consultation.” Unlike student unions which have an elected leadership and represent their entire student bodies, the only student groups present at Ontario’s Free Speech Roundtable were tiny, issue-based, and self-selecting, representing nobody but themselves. These particular “free speech” groups were formed in recent years in order to defend the presence of hateful and bigoted views on campus, from Jordan Peterson’s transphobic conspiracy theories to Faith Goldy’s ethno-nationalism. In fact, these groups often appear to have alt-right ideological tendencies themselves; earlier in 2018, Di Franco appeared on the show of the alt-right Proud Boys gang leader Gavin McInnis, after protestors disrupted a lecture his group had scheduled with a controversial anti-feminist speaker. Michele Di Franco, who claims to have given Doug Ford the idea to make student fees voluntary, speaking to alt-right Proud Boys leader Gavin McInnes in 2018. It may not be surprising, then, that the folks over at Gavin McInnes’s old employer Rebel Media (a far-right website which churns out racist conspiracy theories) have been celebrating the announcement of Ford’s “Student Choice Initiative.” In fact, Rebel reporter Keean Bexte — who has recently been exposed as a white supremacist who worked at a white supremacy web store — has been tweeting in favour of “voluntary student unionism” for years. If the political motivations behind the Student Choice Initiative were not already clear, Bexte and Ezra Levant both argue that the policy will defund progressive organizations on campus. Similarly, a representative of the Conservative campus club at Carleton University defended the policy on CBC’s Ontario Today, by pointing to the fact that student funds are currently going towards organizations including OPIRG and the Canadian Federation of Students. What he failed to mention is that in recent years there have been rightwing efforts to defund both organizations, but these initiatives failed when students actually voted to maintain these groups’ funding. By allowing students to opt-out, Ford’s policy effectively circumvents the democratic decisions already made by the Carleton University student body. It’s just another example of petty vengeance politics by the Progressive Conservatives. It turns out that Doug Ford’s student-union-busting “Student Choice Initiative,” which undermines student democracy and threatens to destabilize virtually all campus activities, was subject to absolutely zero consultation. The government failed to speak to any students except for a handful of tiny non-representative organizations with alt-right sympathies, and the policy’s most public champions are associated with Rebel Media. Moreover, it is evident that the real motivation for this policy is not to save students money, but to crush their political opponents (and they are willing to threaten the viability of all student services in the process). But then again, what else should we have expected? This is, after all, a party that idolizes reactionary grifter Jordan Peterson, and which is led by a Premier who maintains a “great working relationship” with Rebel Media and refuses to distance himself from white supremacist Faith Goldy. The alt-right fringe may be a tiny part of Doug Ford’s coalition, but on education it appears to be calling all the shots. 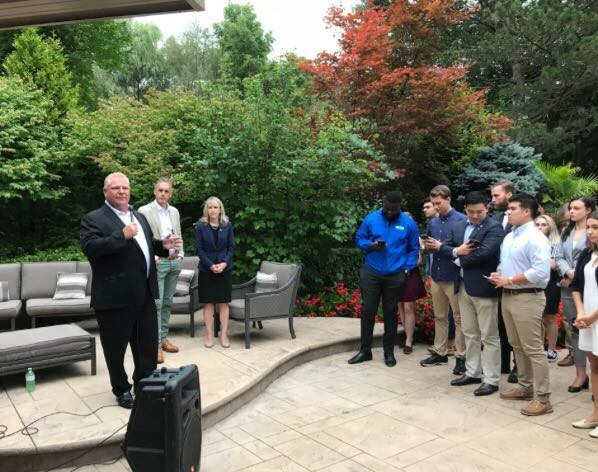 August 31, 2018 — Doug Ford, Merrilee Fullerton, and Jordan Peterson at a Ontario PC Youth Association BBQ. Source: Facebook / OPCYA.